Efficiency- Michael: What REALLY is a car? Beautiful Scenery, empty roads, someone with perfect hair driving a car, trendy music, and a ‘low cost’ financing plan. Commercials will try to convince you that buying or leasing a new car is your ticket to happiness, popularity, and no traffic. See beyond Automotive Marketing so you can get a higher quality product and save hundreds of thousands of dollars in your lifetime. The goal of this article is to debunk the myth that a new or leased car will ever be lower cost than a Used Car. Disclaimer: I work in Auto, if you want to see how unbiased and objective I make this website, this is your article. Usually I go through the math first, add a drum roll, and present the data. However, it shouldn’t exactly surprise anyone that Used cars are lower cost than New. This data doesn’t tell the full story of my findings, and I encourage you to continue reading and explore the raw data. Depending on what dealership you go to, what features you select, private seller vs licensed… Prices for a used OR new car are going vary drastically. The lowest cost New cars are misleading, they exist to ‘get you in the door’. An Advertised 12,000 dollar Nissan Altima is likely going to cost you something closer to 16,000 dollars by the time you sign. To see this further, a 2014 Ford F150 ‘costs more’ than a 2017 Ford F150. A New Car buyer does not often buy the economy version. However, to kill the myth that a New Car is cheaper, I wanted to give New Cars the benefit of doubt. 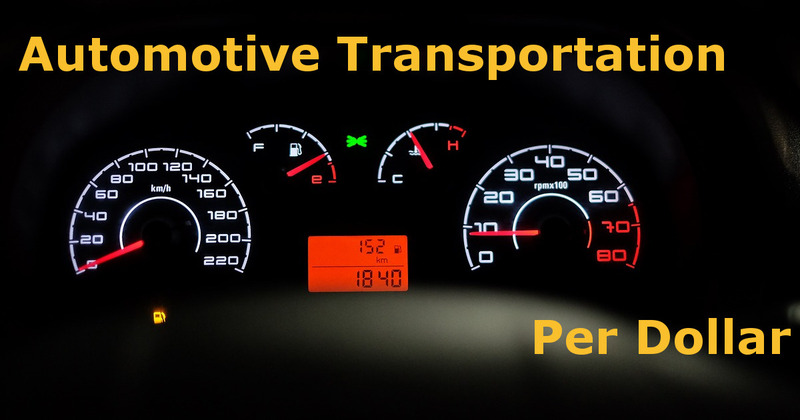 New, Lease, and Used cars all have different quality aspects that should be noted. New cars often come with 3 years of ‘fix all’ problems. ~30,000 dollars and for 3 years, you wont be worried about the cost of a surprise issue, the manufacturer will take care of it. They also have the “latest technology” and styling. Lease cars are similar, taking the risk of a future problems and granting you the latest car available. These are often lower cost out of pocket, but a New car may last over a decade. Used cars vary greatly. A 500 dollar car is unreliable, but a used car from 2015 will be as reliable as any. Technology can be as young as 2 years old which means it will have power mirrors, windows, and a backup cam. I surveyed people on the Efficiency Is Everything Facebook to find out what repairs they needed. I found that on a yearly average, a user can expect to spend about 900 dollars a year on Repairs and Maintenance. Adding in averages for Fuel, Insurance, Government Licences- A car costs a total of ~4300$/year to maintain after purchase. I was surprised that given my unique inputs, the cost of car ownership was very similar to AAA’s calculation. Also note- I did not include financing and depreciation. As time goes on, a 30,000 dollar car will be averaged over years and years. I used 5 years of ownership for Miles Per Dollar. The raw data has calculations for 1,2,5, and 10 years. 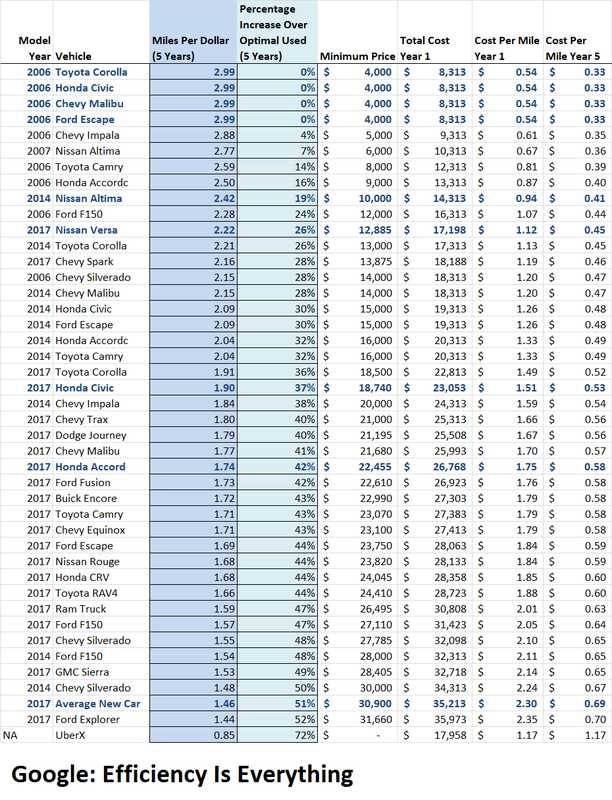 I will use the Average New Car cost and compare. Before this article, I don’t think I could have survived a Car Dealership Salesmen. ~$30,000 New or 1.4 Miles per Dollar. For Uber, I used an estimated cost of a 20 mile, 30 minute drive, converted to Cost Per Mile, and multiplied that by the 15,000 miles an Average American drives per year. The survey turned out fascinating, with reasons for buying new that surprised me, we break this down into Monetary, Time, and Perceived Quality. My recommendation in 1 sentence: Get a used car you can afford WITHOUT having to finance it, and make sure it has side airbags. Used Cars are cheaper than a New Car. While not a single person surveyed claimed to spend more than 7,000 dollars on repairs over the lifespan of their vehicle, a single 10,000 dollar repair would still be lower cost than the average cost of a new vehicle. The most common words from a New Car buyer is that they avoid being stranded. This seems to be a pretty rare occurrence, I did want to note it. I couldn’t find any probabilities, but it seems to be something that doesn’t happen in cars under 10 years old. Beyond that, it continues to be a rare occurrence. My recommendation: Get stranded, and Uber to your final destination. I found this quote fascinating. What exactly is amazing about a new car? Is there a difference between a sweaty factory worker moving the car out of the assembly plant and having someone drive 30,000 miles in a vehicle before giving it to you? I’m not sure, I buy shirts that I know other people tried on. I wish I could quantify this into a unit. I understand, it is weird to think of people living in your Home before you. Although I personally wouldn’t pay any premium for this ‘unused’ feature. There is a Showoffy aspect of having a new car. Personally I think this is Tacky. To each their own. I would bet that this feeling of ‘keeping up with the Jones’ is Marketing. As someone with a household income significantly higher than 6 figures, I’m giving permission to laugh off commercials, luxury products, and new products. This is Marketing to those that don’t know better. If cars are a hobby… you probably aren’t buying new cars anyway. Older cars are easier to work with and are more unique. If you like the feeling of buying a new car… That’s Marketing. For the same reason, collecting luxury products like $1,000 Watches- its Marketing. The rest of this article is my personal opinion and is not backed by data. Working in South East Michigan has brought me around people with strong car opinions. While reviews your Model + Model Year are your greatest indicator of how your car will perform, I have some Stereotypes for each company. Note- I’ve worked with Honda, Ford, General Motors, and Nissan. Honda + Toyota– Very Reliable but boring cars. Japanese manufactures focus on long lasting components at the cost of having older technology and styles. Ford – American manufactures focus on the latest technology. Ford was the first company to have a Smart display Sync. However, being first, users were frustrated with the untried interface. Similar reliability as Japanese manufacturers. General Motors (Chevy, Buick, etc..)– Similar to Ford. Latest and greatest technology. Slightly more expensive than Ford. Similar reliability. Nissan and Fiat Chrystler These companies have management issues that cascade down to products. The engineers have a reputation of ‘doing what they want’. Risky buy IMO. – German superiority translates into high cost vehicles, high cost components, and a funky style. People pay the premium for the uniqueness on the road. Similar reliability as Japanese manufacturers. Kia I’m not a fan of Kia. I have benchmarked their cars and studied their marketing. They seem to go for low quality products but sell their cars at moderate prices. Cute Mice dancing is marketing and wont have an effect on your millage. Tesla I like Elon Musk, but if I am going to recommend a low cost, high miles per dollar car. I cannot. Tesla vehicles are brand new, first model years ever. They havent had the experience of decades of testing and lessons. This is unavoidable for a new car. When you buy a Tesla, you are buying into the marketing like a Gucci Car rather than a reliable automobile. Despite everything I posted, reviews for the specific Model Year are more important than brand name. I would look for something 1 year AFTER a major revision release.